Few things in life are more frustrating than working hard for so many years, raising a family, accomplishing some good things only to realize one day that you’ve barely been living above the level of mediocrity. You’ve been going in circles, chasing your tail, and have made no real progress. This can happen in your career, in your spiritual life, in your relationship or marriage, virtually any aspect of life is susceptible to falling victim to becoming a rut. How do you dig out of it? What do you do different? We’ve all heard that one of the best definitions of insanity is doing the same thing over and over but expecting a different result each time. Why not make today the day that you determine to dump the “same old same old” and take back control of your life? Maybe the only thing holding you back from living a life of expectancy and excellence is a partner to help walk you through it. 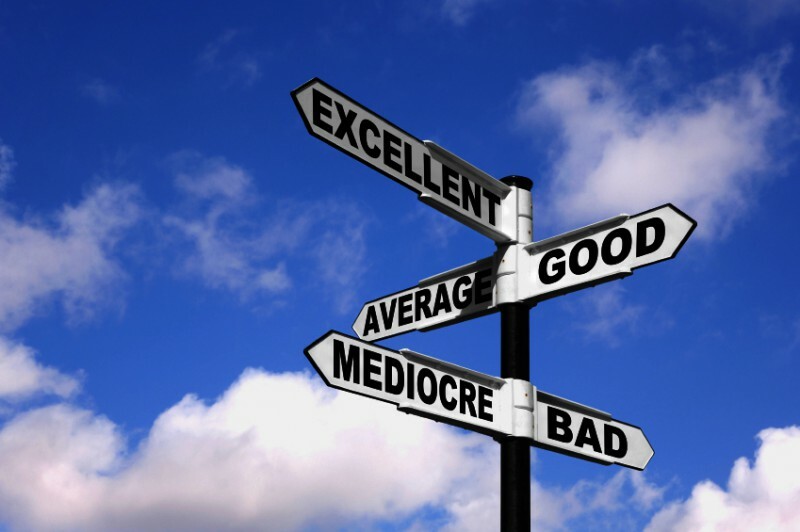 You’ll notice that on the sign above, the difference between mediocre and excellence is just a few degrees. You might be surprised at the subtlety of the shifts that can make your life turn around. That said, moving forward can be a scary thing, especially if you have become comfortable and familiar with your mediocre surroundings. But life can be different…it can be better…it can be more than you ever hoped it could be! As the advertisement says, “Don’t be a settler.” Get the most from your life and make every day count!